As experience has increased in surgical referral centers, the published morbidity and mortality rates for pancreaticoduodenectomy have declined. 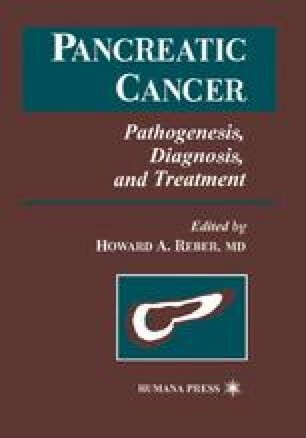 Surgeons have focused on how to perform the operation safely, but less attention has been given to which patients are the most suitable candidates for pancreatectomy, or to such fundamental oncologic issues as the definition and status of microscopic surgical margins, the anatomic distribution of regional lymph node metastases, and patterns of tumor recurrence and their implications for site-specific therapeutic intervention. In contrast to surgery for adenocarcinoma of the esophagus, stomach, or colorectum, pancreaticoduodenectomy requires complete reconstruction of the upper gastrointestinal tract, including reanastomosis of the pancreas, bile duct, and stomach. The magnitude of the operation and its associated morbidity often result in a lengthy period of recovery. For patients who experience early tumor recurrence, quality survival time may be quite brief, because the time of surgical recovery merges with the time of symptomatic tumor recurrence.